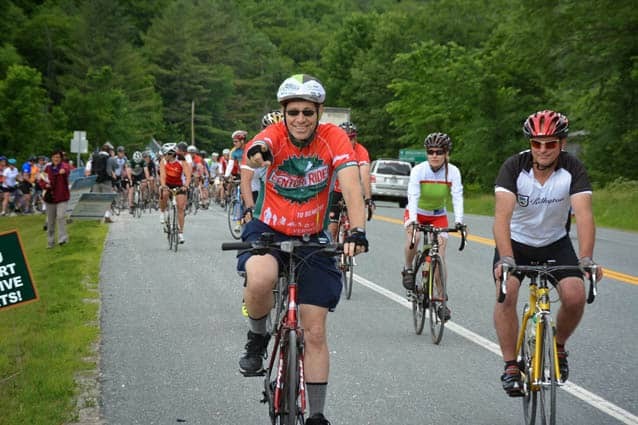 The fifth annual Long Trail Century Ride to benefit Vermont Adaptive Ski and Sports returns to Vermont again on Saturday, June 27, where cyclists of all abilities can ride a century, 60- or 20-mile course to raise funds and awareness for disabled sports programming. Adaptive athletes are sponsored and ride for free. The goal is to raise $200,000 this year, which is used for adaptive programming and equipment. The century ride, plus 60- and 20-mile routes, start and end at the Long Trail Brewery in Bridgewater Corners. The routes travel through Killington and surrounding communities including Pittsfield, Stockbridge, Bethel, Woodstock, and Ludlow. An après-ride party, featuring live music with Duane Carleton plus the Pete Kilpatrick Band, face painting, kids games, a vendor village, Lazy Cow ice cream, adaptive equipment demos and more will be held after the ride at the brewery for all to enjoy – riders, spectators and visitors alike. For those not riding, party-only tickets may be purchased in advance or at the door. The event is held rain or shine. For more info, visit longtrailcenturyride.com.